Lilly Pearlman has grown up in Maine immersed in the musical traditions of Scotland and Cape Breton, performing with family band Highland Soles since the age of nine. 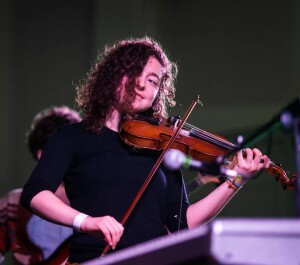 Through her experiences living and studying in New York City and Salvador da Bahia, Brazil, she has continued to explore and incorporate influences from various other musical genres–from bluegrass to samba to funk– into her unique Celtic-based fiddle sound. Lilly plays throughout the U.S, Mexico and Canada with the bands Alba’s Edge, Party of Three, and the Highland Soles Trio since 2011. She was also on staff for Alasdair Fraser & Natalie Haas’ Scottish Fiddle and Cello Camp at Ashokan, March 2014 & 2015. Lilly has enjoyed the beauties of Maine Fiddle Camp since 2007 and looks forward to being back this year!